While practicing gastroenterology for more than 20 years, Dr. Stump has been actively involved with the medical education and training of new physicians throughout his career. As chief of gastroenterology at Audie L. Murphy Memorial Veterans Hospital, he served for six years as a full-time associate professor of the University of Texas Health Science Center in San Antonio. During that time he was principal teacher of gastroenterology for medical students and house medical staff and won numerous awards for his work. 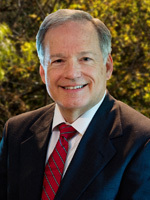 He has also served as chief of gastroenterology and chief of medicine at Methodist Hospital in San Antonio. A native of Indiana, Dr. Stump is a graduate of Purdue University and attended medical school and the internal medicine residency program at Indiana University. He also completed a gastroenterology fellowship in San Antonio. He is certified by the American Boards of Internal Medicine and Gastroenterology.